🚀 Reminder that the Axios Space newsletter launches tomorrow. Sign up here. Endeavor continues to work toward an IPO later this year, but it no longer looks like the Hollywood talent agency that Ari Emanuel first built and later merged with William Morris. Endeavor, backed by such investors as Silver Lake and SoftBank, has arguably morhped into an events company. Not only through the purchases on Ultimate Fighting Championship and Professional Bull Riders, but also through a video streaming effort that's signed such event-centered clients as World Wrestling Entertainment. It also launched an "experiences" arm that has agreed in principle to buy On Location Experiences, which provides on-site events and access at NFL games. A source puts On Location's enterprise value at around $700 million, with the NFL rolling over its 20% ownership stake. Private equity backers like RedBird Capital, Bruin Sports Capital and 32 Capital will exit — after having bought in at around a $70 million valuation. 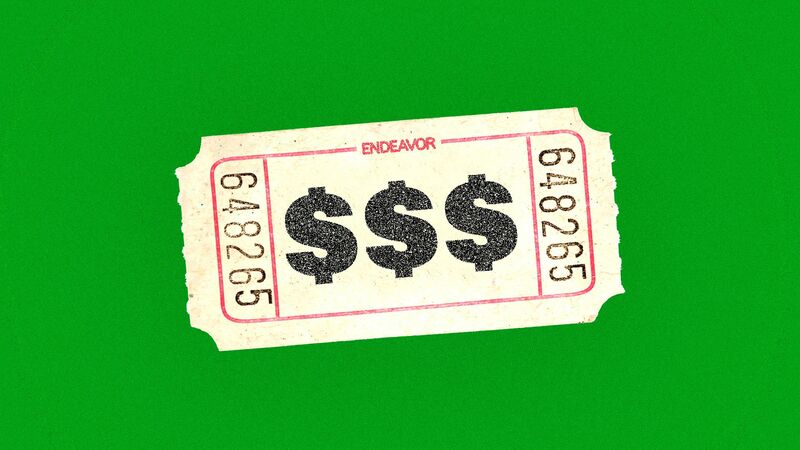 On Location generated nearly $60 million in 2018 EBITDA, and Endeavor expects to close the deal in several months (assuming no red flags during due diligence). All of this comes shortly after Endeavor unloaded its 49% stake in digital ad company Droga5 to Accenture Interactive, thus further accentuating the events part of its income statement. Bottom line: We don't know the exact breakdown of Endeavor's representation vs. events units, particularly since the former also includes media rights. But we do know that this will look a lot different than it did when Silver Lake first invested five years ago. • See no evil, hear no evil: Saudi Aramco reportedly has $30 billion of investor interest in its debut bond sale, following a global road-show that's slated to finish up today. Among the stops was New York City, where JPMorgan CEO Jamie Dimon spoke on behalf of his bank's controversial client. Why it matters: Because it seems that Jamal Khashoggi doesn't. • Put a pin in it: Pinterest this morning set IPO terms, as the unicorn parade continues down Wall Street. Most of the attention, understandably, will be on how Pinterest is targeting a lower initial valuation (both market cap and fully-diluted) via IPO than it received in its last private round ($12.3 billion post-money). On the one hand, it's absurd to tie this into the perceived disappointment of Lyft's IPO. Not only because the two companies are in entirely industries, but also because Zoom Video just filed for an IPO that would give it an initial market cap of around 7x its last private valuation. But, but, but... Private market investors have indulged some their own unicorn herd mentality when it comes to valuations, particularly for those companies with higher public profiles (Pinterest>Zoom, in this regard). And, remember, a lot of the pre-IPO money and IPO money is now managed by the same people. • New voice: Leigh Farris is joining The Carlyle Group as head of global communications. She succeeds Chris Ullman, who retired at the end of 2018, and has spent the past five years doing comms for Goldman Sachs. 🚬 Quit it: Philip Morris International today launched a new public health initiative called "The Year of Unsmoke," aimed at both dissuading people from beginning to smoke and getting smokers to quit. PMI is a different company from Altria, which owns Phillip Morris USA and recently bought big into Juul. If "unsmoking" was truly a priority for these companies, they would stop selling cigarettes, including their popular Marlboro brand. 🏀 March Madness: More than 1,300 Pro Rata readers participated in our bracket challenge, and now we're down to two: Adam Cromie, a lawyer with Jones Day who once was assistant GM of the Washington Nationals, and Steve Teubl, a Chicago-based angel investor and private wealth manager for Merrill Lynch, Pierce, Fenner & Smith. Adam picked Virginia and Steve picked Texas Tech. Good luck tonight! Why it's the BFD: This would be the first restaurant company to enter the U.S. public markets in four years. Or, in this case, re-enter. Backstory: Apollo Global Management paid $1.3 billion to take Chuck E. Cheese private in 2014 (including debt) and will hold a 51% stake in the newly-formed company. Apollo held sale talks in early 2017, but no deal materialized. Bottom line: "Its average customer is between three and eight years-old. That means around 20% of your customer base ages out every year and a new group ages in, so it remains quite fresh for new customers, even though it's been around for 42 years." — Lyndon Lea, co-founder of Lion Capital, speaking to Axios. • Nautic Partners acquired LindFast Solutions Group, a Blaine, Minn.-based distributor of specialty fasteners. • Zoom Video, a San Jose, Calif.-based videoconferencing company, set IPO terms to 20.87 million shares at $28-$32 per share. It would have an initial market cap of around $7.7 billion, were it to price in the middle, and plans to trade on the Nasdaq (ZM) with Morgan Stanley as lead underwriter. Zoom reports $7.6 million of net income on $331 million in revenue for 2018, and raised around $160 million in VC funding from firms like Emergence Capital Partners (12.5% pre-IPO stake) and Sequoia Capital (11.4%). • B Capital, a VC firm co-founded by Eduardo Saverin, has raised $406 million for its second fund. • Scott Dahnke, co-CEO of private equity firm L Catterton, joined the board of Williams-Sonoma (NYSE: WSM). • Hunter McCrossin has stepped down as head of private market investments for Vanderbilt University, in order to join Columbia University's investment office as a managing director.